Welcome back to the Summer term. I hope you all had an enjoyable break over Easter. A special welcome back to Louise Ormiston after her maternity leave and a welcome to Amélie, who joins us in rang 4. We have a busy term ahead as always and I would ask you to note the contents of this newsletter carefully, please. I expect all pupils to be on time for school, especially with the brighter mornings. We open the gate in time for everyone to be in class for 8.30am. Children who arrive after 8.40am will be marked as late from now on. I have spoken to the children in rang 5 and rang 6 about their part in getting to school on time. I will speak with parents of children in other classes if there are any issues. As we announced before Easter, we are delighted that we will shortly be beginning work on the park in Mountpleasant Square. As you know, Dublin City Council has included a sum of €24,000 in its 2015 budget to undertake improvement works at Mountpleasant Square Park. This project aims to conserve and upgrade the public park at Mountpleasant Square to improve it as an amenity for the whole community. RMDS, together with the local residents and the Tennis Club are looking forward to working together to make a better park for our community. In addition to school closings already notified, the school will be closed on Friday 22nd May due to the upcoming referendum. The school website (www.rmds.ie) has details of all closures, (including provisional term dates for next year) and upcoming events on the calendar section. The annual school tours and outings for all the classes are also included here. The first event of the term will be the annual Spring Clean up of the area around the school. This is organized between the Parents Association and the School Council. We will meet at the school gate on next Wednesday 22nd April at 9am for about 45 minutes. Gloves and equipment will be provided. No toddlers please! 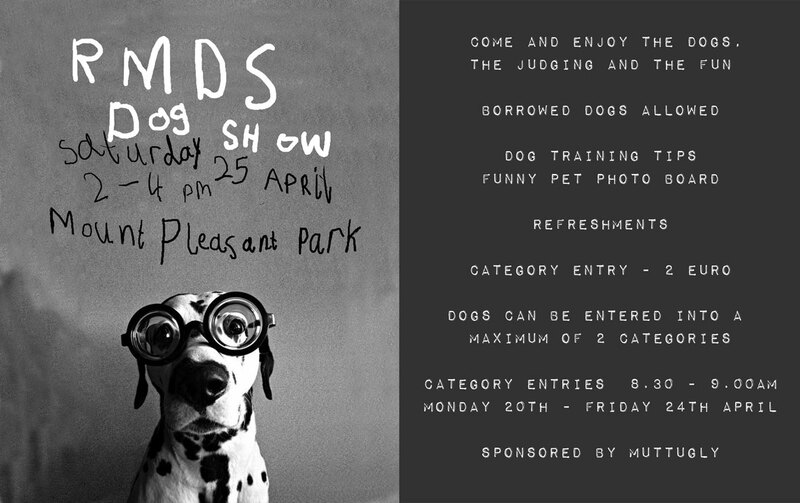 The Parents Association have also been busy over Easter organizing the RMDS dog show in Mountpleasant Park on Saturday 25th April between 2 and 4pm. Registration will take place at the school gates Monday to Thursday next week. 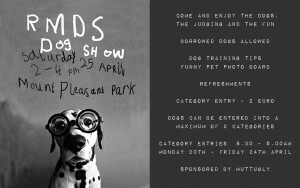 We hope to see all of your pampered pooches there on the day! There will also be refreshments and plenty of fun for all. We do ask that parents please accompany children with their dogs, and that dogs are kept on leads at all times. We will also have a dog trainer available on the day who will be giving tips to help us all better manage our dogs at home and when out and about. Children are also encouraged to register borrowed dogs (friends, neighbours or granny's dog!). There is a 2 euro charge for each category entered, and dogs can enter a maximum of two classes. There will also be a "Quirky Pet Photo" so children are encouraged to bring photos of other pets - not just dogs! We will meet the Senior Infant parents to explain the Forest School Programme for the class on Tuesday 28th April at 8.45am in the Seomra spraoi. In the meantime be on the lookout for walking boots or wellies, waterproof leggings and jackets for your child if they don’t have them already. On Wednesday 29th April we will have the assemblies for the Write a Book projects. Again this year it was a very successful project and thanks to all the parents and teachers who helped the children to produce such great work. Rang 6 (with some help from Rang 5) will treat the school to a performance of Charlie and the Chocolate Factory on 30th April. This will be followed by a performance for parents on Friday 1st May at 9.45am. Intensive rehearsals are underway at present so it promises to be a great show! On that note if you have access to any props/costumes etc that might be helpful, please talk to myself or to the class teachers, Marguerite Ryan and Paul Fairbrother. As mentioned previously we have been working on an IT plan for the school over the past few months as part of the school self evaluation process. We will have an information meeting /discussion for parents at 8.45am on Thursday 14th May here in the school, for about an hour. We will circulate the draft document in advance of the meeting for your comments. We also hope to have a Water Action day on 21st May as part of the Green Schools project. The Educate Together AGM will take place in Portlaoise on Saturday 23rd May. The Reception Day for the incoming junior infants will be Friday 29th May – there will be no school on that day for the present junior infants. The summer term brings lots of sporting activities, kicking off with the primary schools athletics in Santry stadium on Wednesday 27th May. Pupils from Rang 3, 4 and 5 are busy training each week from now on in Sundrive Park for the event. This will be followed by our annual sport for all day on Friday 5th June and the annual Sports Day and Summer Fair on Sunday 14th of June. The RMDS End of Year Parents Night Out will take place on Friday 12th June and as the term draws to a close the Rang 6 parents will have a gathering on the evening of Friday 19th June to mark their children’s time with us here in RMDS. The Rang 6 graduation will take place on Wednesday 24th June at 9.30am in the GP room. School will close for the summer at midday on Tuesday 30th June. Welcome back to the Summer term of extracurricular activities. Classes begin on the week of Monday 20th April for a 9 week term concluding on the week of 15th June. Below is the programme for this term. Enrolment forms are also included. Enrolment is on a first come, first served basis. Children enrolled in the first term are given priority for this term. Please return booking forms tomorrow – cheques can be given directly to the teachers next week. Extra application forms are available beside the box or you can write out the required information on a sheet. Children should be collected from the front door of the school (Ranelagh Road) for activities which take place in the school. For activities which begin later in the afternoon, children should be dropped to the front door. Collect at the Mountpleasant LTC or Herbert Park otherwise. Please collect your child promptly. To ensure that all children enjoy these classes, we expect the same standards of behaviour as we would in school. All children are expected to act with respect and kindness to their peers and teachers. Children who are not able to do this will not be allowed to take part and monies paid will be refunded. Extra curricular teachers will contact you if classes are cancelled for any reason. Cancelled classes will be made up at the end or monies refunded if that is not possible. Contact the extracurricular teacher in the first instance regarding any issues or difficulties that arise. If that does not sort out the problem, please contact the principal. ***Please note swimming cheques and forms should be brought directly to the pool on Wednesday 22nd – any left in the office will be returned to the children.